I am happy to report that the dragon has departed our fair country, and that it way my good friend, fluttershy, who convinced him to go. This adventure has taught me that your friends can help you overcome even your greatest fears. Hey there! So I imagine you've picked up this book knowing a little bit about My Little Pony: Friendship is Magic. You've probably had a quick look through the book and are wondering exactly what it is. 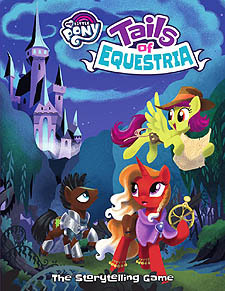 This book is a manual for a storytelling game, which allow you and your friends to create your very own pony characters to explore the amazing and magical world of Equestria - will you be a dynamic adventurer like Daring do or a bold treasure hunter like Rarity? Wait, wait, wait! You said this is a game, but this is clearly a book! You're right, but it's actually both a book and a game. This book contains rules and a story. Rules that will tell you how to make a strong, clever, or charming pony. A story that you and your friends will enjoy, where the choices you make will change the story itself until you are telling the story as much as the book or the GM. A GM (gamemaster) is a player at the table, but instead of playing a a pony, he or she will play as a storyteller, impersonating all of the ponies you meet, the beasts you face, and the challenges you have to overcome. Think of the GM as a narrator in a movie - it is his or her role to tell the players exactly what is happening in the story and what the outcomes of their actions are, depending on their choices. Winning a storytelling game is very easy; you just need to have fun! Tales of Equestria is not about getting to the end of a board or having the most points, but all about having fantastical adventures and using the magic of Friendship to overcome any obstacles that stand in your way. You and your friends, including the GM, are all on the same team - as long as every pony is having fun, everybody wins!